The use of recycled lumber has become an important part of sustainable building strategies in recent years. Many different applications can be devised for this type of material, ranging from reuse for the original purpose of the material to wholly unique applications. Using this material is never as straightforward a process as using new material. 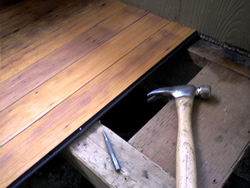 Here I will show the steps of converting recycled 1x4 tongue and groove fir flooring into a new traditional style porch floor for an older home. This shows the pile of material I selected at the salvage yard for the project. An interesting thing about using this sort of material is getting to know something of its history. 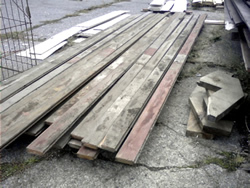 These boards were salvaged during deconstruction of the Holly Street RE Store building, which was the original Sash and Door lumber building. They were covered with other flooring materials and seem to have never been sanded when originally installed. 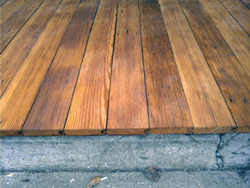 This preserved their full thickness, which is critical to reusing tongue and groove flooring. 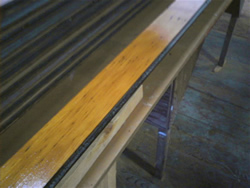 Material that has been sanded more than once can often be too thin to be reused. However, the boards had been stored outside and were in pretty rough shape. 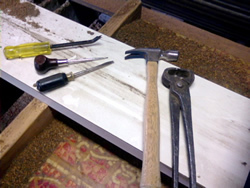 The old hand forged nails, as well as numerous surface carpet tacks, were still in them. Many of the boards were lightly painted. 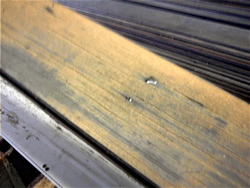 And the boards were extremely dirty, with embedded crud in the grooves. They were also weathered and very dry, and of an older vintage of milling, where the backs (seen here) had been left rough-cut. 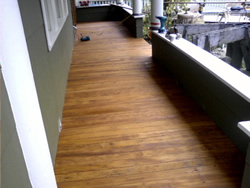 It would not have been a good choice for an interior floor, but for the porch project it would serve well. After each board was brushed with a stiff bristle brush to remove caked dirt a variety of small tools were employed to extract nails and metal from the boards. The yellow handled tack lifter was especially useful for tiny nails. The sharp awl was used to carefully gouge out embedded metal just enough so that the large nippers could get a grip on broken off nails. First pass through the planer. 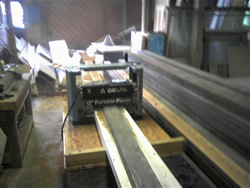 A flat infeed/outfeed table running right through the throat of the planer gives superior results and reduces “sniping” – a tendency for the machine to dig deeper as it exits if the board is not well supported. 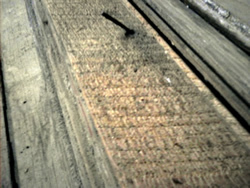 Notice the blond wood being produced as the board exits the far end. There were sixty 12 foot long boards. But even after six hours of cleaning and de-nailing I hit metal on about one third of them on the first pass. After more de-nailing, and switching to fresh planer blades, they were ready for the second pass. 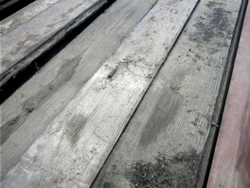 This is how the boards looked after the second pass – ready for finish. Every board was coated on all sides with a high quality exterior finish. The back was coated using a small roller, being careful not to apply too much. I rolled any excess along the edges. Then for the fronts I used a different roller (so as not to get debris from the back onto the clean fronts). Then the front was “tipped off” and the finish was made to “lay” by lightly running the tip of a brush in the direction of the grain. Because of the cold weather, as each board was coated it was set into this rack, with a plastic tent built over it. When the rack was full heaters were set under the tent with the wood and the tent was closed for three days. For the final day the tent was opened in two spots and some circulation was created through it with a fan. The porch being installed on site. Because the wood was brittle each nail hole was pre-drilled and the nails were set by hand. The finished porch. Making the effort to coat the boards on all sides is critical to creating a long lasting installation. The coating on the back side prevents moisture from the open crawlspace under the porch from migrating through the boards from below. This preserves the integrity of the top coat finish from blistering, and also creates a much more stable expansion and contraction for each board, helping to keep the nails tight and the wood from cupping and checking. Another shot of the finished porch floor. 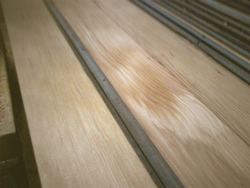 Here you can see how, even after two passes through the planer, the boards have retained sufficient thickness on their upper surface so that the upper portion of the grooved sides is not so thin that it may split. This is the critical place to look at when evaluating if salvaged stock is suitable for reuse. When the weather is warm enough this porch will receive at least one more coat of finish on top. This second coat will sit more on the surface, creating a glossier look and providing a protective wear surface for the wood. 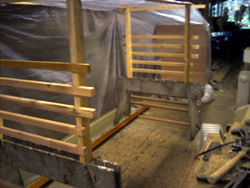 Additional information about this project is on our Reused Lumber page.